Daily alerts and critical analysis of terrorist activity, including threats to banks, financial services, & corporate entities. Key methods by which terrorist groups carry out money-laundering activity, and transfer and receive funds. Tracking & assessment of economically motivated campaigns promoting attacks or sabotage on financial institutions and businesses. To subscribe or for more information, contact SITE at [email protected]. Custom services are also available upon request. Alerts and analytical reports on terrorist threats to the energy sector and critical infrastructures, including transportation, telecommunications, public health, agriculture, and other vital services. Updates on global trends and terrorist activity in energy-producing areas, with special region-focused reports covering groups such as ISIS and al-Qaeda in the Middle East, Africa, and Asia, as well as eco-extremist and far-left groups in the Americas and Europe. Reports using official communiques, online chatter, international media sources, and existing SITE research to provide political, geopolitical, and ideological factors motivating such threats and attacks. Members of the press, please contact us at [email protected]. Please fill out the form below. (*) are required fields. Must use your press email to apply. Not affiliated with an organization? Click here to find out about our SITE Personal Edition service. SITE offers resources for all counter-terror researchers, whether you’re a law enforcement official keeping tabs on terrorist chatter, an academic studying the history of an extremist movement, or an ICT company scanning for dangerous content on your servers. SITE’s services span rapidly emailed news alerts, sector-specific analytical reports, and real-time feeds of terrorist-related data. These resources are reinforced by SITE’s unmatched database, which spans decades of statements, media, chatter, and data from extremist entities around the globe. Covers all aspects of the global jihadist movement: media, military activity, chatter, etc. Tracks and reports on trends and threats from militia organizations, neo-Nazis, white supremacists, anarchists, eco-terrorists, and other extremists. 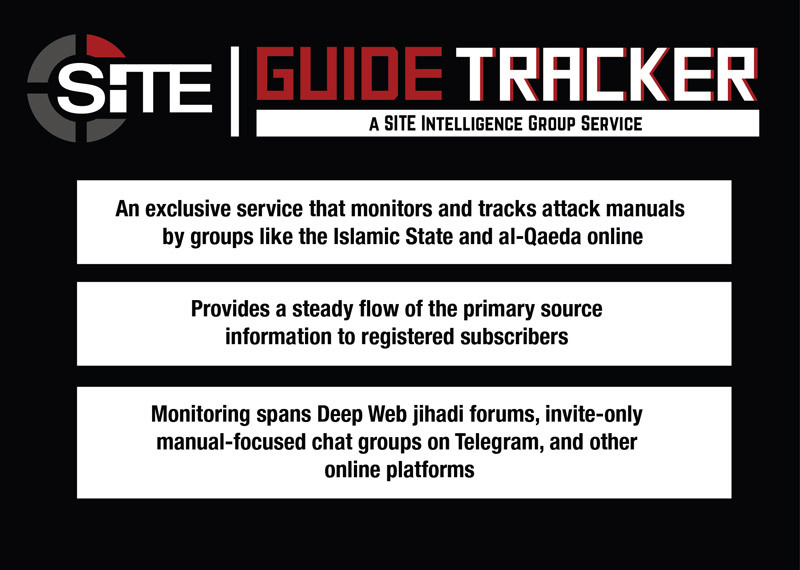 SITE’s Jihadist Threat service gives government, commercial, academic, and other institutions access to real-time reports and analysis of material distributed by jihadi terrorist groups and their supporters worldwide. This includes primary source material (videos, statements, speeches, claims of attacks, manuals, magazines and other propaganda) as well as commentary from individuals on social media platforms, including calls for recruitment, incitement, and threats. Groups covered include ISIS and al-Qaeda, as well as their respective branches in the Middle East, Africa, Central and East Asia. Also included are Taliban groups in Afghanistan and Pakistan, and aligned Syrian militant factions. ENTERPRISE: Access to full translations, streaming multimedia, and analysis via SITE Enterprise portal and emails. Customizable packages of various SITE services available. INDIVIDUAL: Summaries of content with occasional access to multimedia and/or full translations via SITE News portal. Does not include daily emails. Weekly report tracking, analyzing, and summarizing ISIS attacks, active locations, strategies, and trends around the world. Assesses the group’s propaganda campaigns, global reach, and strength of its various provincial divisions (as well as other aligned military presences across different regions). Also covers ISIS-linked media groups and supporters’ social media campaigns, cyber operations, and incitements. Analyses utilize official terrorist communiques, online chatter, media reports, and existing SITE research. Reports are also supplemented by exclusive SITE-produced maps and infographics, which provide detailed breakdowns of military activities (types of attacks, locations, targets), regional trends, and other matters. Terrorist chatter is collected from various online sources, including invite-only encrypted chat groups, social media, and Deep-Web forums, among other spaces. Reports also examine the symbiotic dynamics between ISIS’ central media division and its network of linked and supportive media groups, detailing trends regarding targets, regions, and other matters. Monthly report covering al-Qaeda affiliates’ attack claims and suicide operations—including those by the Shabaab al-Mujahideen Movement, al-Qaeda in the Arabian Peninsula (AQAP), al-Qaeda in the Islamic Maghreb (AQIM), al-Qaeda in the Indian Subcontinent (AQIS), and Nusrat al-Islam wal Muslimeen (NIM). Also covers activity by al-Qaeda-aligned organizations in Syria, Kashmir, and other locations, as well as content and activity by pro-AQ media groups and individuals online. Issues provide detailed analyses of attack claims and suicide operations and examine military and propaganda campaigns based on official communiques, online chatter, media reports, and existing SITE research. Analyses are supplemented by exclusive SITE-produced maps and infographics, which provide detailed breakdowns of military activities (types of attacks, locations, targets) and regional trends for al-Qaeda affiliates. 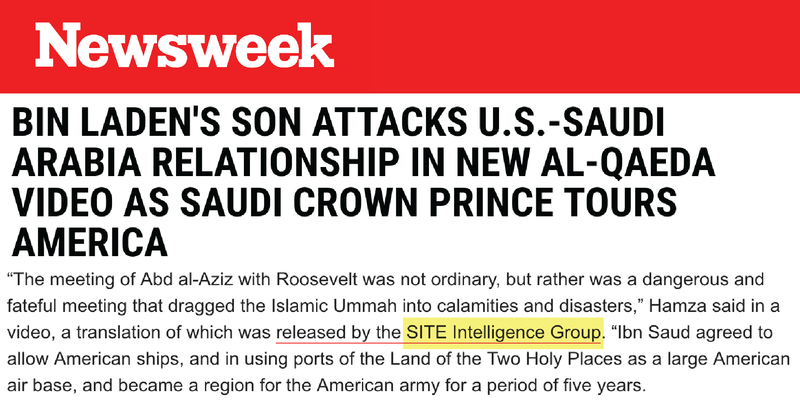 Also examines rhetoric from al-Qaeda Central (news bulletins, leadership speeches, etc. ), including incitements against countries, outreach to specific audiences, and other matters. Periodic report providing trend analysis of recruitment efforts and campaigns by or suited toward Western jihadists. Reporting and analyses—which span incitements, attack targets, recruitment appeals, migration to foreign battlefronts, and other matters—are based on official communiques, online chatter, media reports, and existing SITE research. Covers groups and individuals operating in Western countries and fighters abroad, as well as Western-aimed propaganda by terrorist media groups. Examines Western languages utilized in propaganda by ISIS, al-Qaeda, and other terrorist organizations while providing detailed analyses of affiliated groups and media outlets in Syria, Iraq and other locations. Monitored entities span major media distributors and translators like the Global Islamic Media Front (GIMF) and al-Tamkin to independent, to fighter-operated content-producers like al-Risalah. Reports also give updates on Western fighters, including appearances in multimedia, reports of death, social media activity, and other matters. Alerts and special reports analyzing terrorists’ impact on the finance sector, including security threats to banks, financial services, and businesses. Identifies key methods by which terrorist groups conduct online terror financing (donation campaigns, cryptocurrencies, crowdfunding, money transfer services, etc.) and money-laundering activities. Reports also explain how economic threats and attacks fit into the larger, global aims of terrorist groups like ISIS and al-Qaeda via leadership statements, multimedia campaigns, religious edicts, and other elements. Reports use official communiques, online chatter, international media sources, and existing SITE research to provide political, geopolitical, and ideological factors motivating such threats and attacks. Provides unedited, original versions of terrorist attack manuals being distributed online, including weapons and explosive materials manufacturing, purchasing and constructing homemade devices, and online training courses. Monitoring spans Deep Web jihadi forums, invite-only manual-focused chat groups on Telegram, and other online platforms. DUE TO SENSITIVITY OF CONTENT, THIS SERVICE IS RESTRICTED TO SELECT INSTITUTIONS. PLEASE CONTACT [email protected] FOR MORE INFORMATION. A special service enabling ICT companies and regulators to locate terrorist material on their platforms via unique, data-driven detection methods. Designed for ICT companies and regulating agencies aimed at preventing and responding to jihadist and terrorist use of online platforms, as well as public and private institutions targeted by cyber-attacks. Daily dispatches expose how jihadists and terrorists use ICT—social media platforms, apps, mobile devices, the Dark Web, etc.—for planning, inciting, financing, recruiting, and cyberwarfare. Tracks and examines the latest trends associated with terrorist use of social media platforms, private messaging apps, file-hosting services, messaging forums, mobile devices, and the Dark Web. Analyzes which technologies are most frequently used, and how terrorists adapt to regulatory counter-measures. Designed to help law enforcement and targeted organizations mitigate and respond to emerging threats and prevent hate crimes, while also informing journalists and other media entities of emerging developments and trends. Provides early warning and threat analysis, with immediate reporting on claims of attack, threats, announcements, communiques, and chatter on forums, websites. Tracks online communications of white supremacists, militia groups, anarchist groups, eco-terrorists, and other politically motivated extremists in North America, South America, Europe, and South Africa. Updates provided as part of the service also give crucial context to extremist activity, including regional/global events, political developments, emerging social/political movements, and other variables. What do I get as part of an Individual-level subscription? Individual subscriptions, accessed through the SITE News portal, provide summaries of reports from SITE’s Jihadist Threat service. Individuals subscribers will occasionally receive multimedia, full translations, transcripts, and other items reserved for Enterprise-level subscriptions. Summaries delivered as part of Individual subscriptions are limited to Jihadist Threat material, and not Dark Web and Cyber Security, Far-Right/Far-Left, and other SITE services. Who is a SITE Individual subscription intended for? SITE’s Individual subscriptions are intended for anyone doing research on their own behalf: students, retired military personnel, freelance journalists, and independent researchers, among others. SITE does not provide Individual subscriptions to anyone conducting research on behalf of any company, agency, institution, or organization; any such individuals should register for an Institution-level subscription. How do I register for a SITE Individual subscription? You can register for a SITE individual subscription on our designated sign-up form. What do I get as part of an Institution-level subscription? Institution-level subscribers gain access to decades of terrorist and extremist statements, media, chatter, and data from every corner of the Internet. Our reports are provided with essential context and analysis, along with full translations from SITE’s multilingual staff of experts. SITE’s Institution-level subscriptions are built by one or more of our available services, such as Jihadist Threat, Far-Right/Far-Left, and Dark Web and Cyber Security. We also offer specialized services tailored to specific regions and industries. These services can be purchased individually or bundled together with package rates. Institution-level subscribers receive our reports throughout the day via email, and all content is logged onto SITE’s interactive and easily navigable database, comprised of tens of thousands of reports tagged by category, location, group, individuals, etc. Who is a SITE Institution subscription intended for? SITE’s Institution services are provided to institutions verified by SITE as legitimate and safe to provide our content to. Our clients include government agencies, media organizations, corporations, ICT companies, and non-profit organizations. We accept payments through wire transfer, check, or credit card. How much do Institution subscriptions cost? Prices for our Institution-level monitoring and other services are determined by the type of institution (media, government, non-profit, academic, etc. ), number of registered users, and which SITE services are selected. Can I try SITE’s Institution services before purchasing? We offer sample content to approved entities. However, services containing highly sensitive material are not available for any samples. How can I get more information about SITE’s services? SITE offers personal online demonstrations to institutional and professional parties, in which we showcase our services and find ways to best tailor them to meet your needs. After I’ve subscribed, how can I use SITE’s research and data? SITE material is copyrighted and cannot be redistributed without stated permission. We require any use of our research or material in the media to be sufficiently cited. For more than two decades, SITE Intelligence Group has provided governments and institutions worldwide with verified, actionable intelligence and analysis on terrorist and extremist groups. SITE has developed a one-of-a-kind reputation for immediate access to the most hard-to-reach corners of the extremist online community, staying apace with the continuous adaptations deployed by these groups, and supporting the world’s most powerful governments and corporations in combatting terrorism, protecting people and assets, and preventing online radicalization. Headquartered in the United States, SITE is comprised of a team of top-notch security and cyber analysts with unparalleled intelligence, regional, linguistic and technological expertise. SITE provides services to public and private organizations across the globe, spanning more than 100 countries. SITE services, powered by human intelligence and a comprehensive and unequaled collection of online data, range from subscription-based monitoring and analysis to customized intelligence and investigations. Ms. Katz has infiltrated terrorist fronts undercover, testified before Congress and in terrorism trials, and briefed officials at the White House and the Departments of Justice, Treasury, and Homeland Security. Her investigations and testimony have driven action by several governments against terror-linked organizations and individuals. She has provided counterterrorism training sessions to military leadership, intelligence analysts and law enforcement agents from numerous government agencies in the U.S. and abroad. She has led numerous workshops for non-governmental organizations and academic audiences, and supported policy makers and government institutions worldwide in their efforts to counter terrorism and prevent violent extremism. For her unique contributions to FBI counterterrorism investigations, Ms. Katz received special recognition from FBI Director Robert Mueller for her “outstanding assistance to the FBI in connection with its investigative efforts.” Outlets to profile Ms. Katz have included the New Yorker and 60 Minutes, and her insights have been featured in scores of major publications, including Washington Post, Time, The Daily Beast, VICE, and others. Her counter-terror analyses have touched on such critical topics as messenger applications and ICT platforms, the value of open-source intelligence, evolving recruitment efforts, and the implications of various geopolitical developments, among other matters. 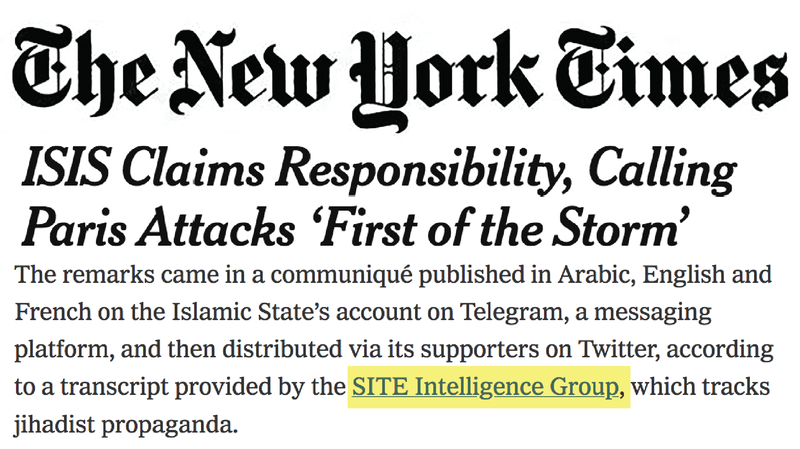 The multi-lingual staff at SITE has years of experience in the research and analysis of terrorist networks, including monitoring jihadist propaganda, studying trends within the online jihadist community, and understanding how jihadist groups utilize the Internet. Professor Bruce Hoffman has been studying terrorism and insurgency for more than thirty years. He is currently a tenured professor in the Security Studies Program at Georgetown University's Edmund A. Walsh School of Foreign Service, Washington, DC. Professor Hoffman previously held the Corporate Chair in Counterterrorism and Counterinsurgency at the RAND Corporation and was also Director of RAND's Washington, DC Ofﬁce. A revised and updated edition of his acclaimed 1998 book, Inside Terrorism, was published in May 2006. Rohan Gunaratna is Head of the International Centre for Political Violence and Terrorism Research, Institute of Defence and Strategic Studies in Singapore. He holds a masters degree in international peace studies from Notre Dame, US, where he was Hesburgh Scholar and a doctorate in international relations from St. Andrews, where he was British Chevening Scholar. He is the author of 12 books including Inside Al Qaeda: Global Network of Terror, published by Columbia University Press, an international bestseller. SITE is the eminent source of breaking news and analysis for most major global media outlets.